Hello, my name is Anna and I am a grade 11 student. For my Ancient Civilizations class I had to make what my teacher calls a ‘Passion Project’, which means that each student got to make any kind of project that they wanted as long as the subject related to the curriculum and we could, to quote my teacher, “get it out to the world”. 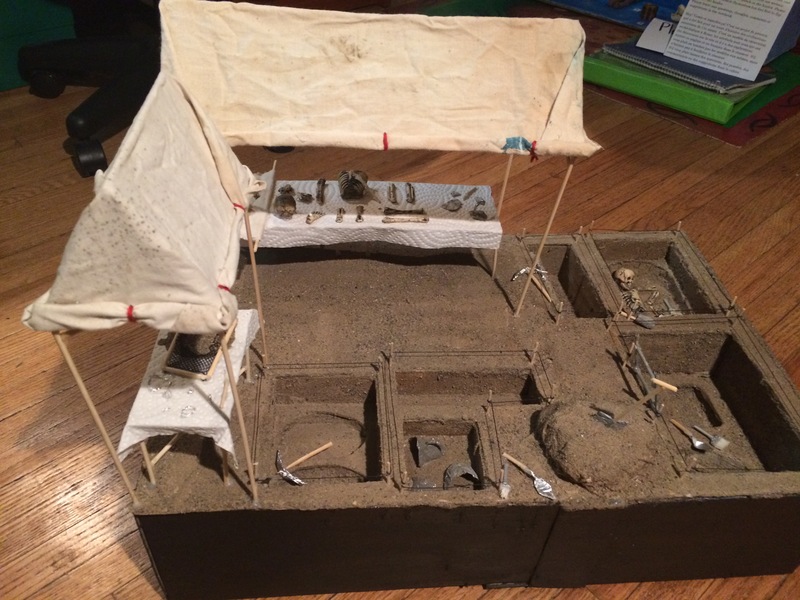 I love to make models and dioramas so as soon as we started brainstorming our projects my mind jumped to a model of a dig site and artifacts that could be found at it. Since it was an Ancient Civilizations class, I decided that a site in Rome would be cool but the model looks as if it could be anywhere, even here in Ontario. For the research part of the project I learned what kind of tools and equipment are used during an archaeological excavation and for the set-up of a site. I looked at photos of sites from all over the world, trying to decide which one I should base my model off of, but I decided that instead of trying to re-create a dig that already exists, it would be more fun to make a completely new site. My project, inspired by archaeology in Rome. Then began the planning and creation of the diorama, I made a few rough sketches (although I didn’t follow them too closely!) and got out a bunch of old shoe boxes and a hot glue gun. I started by making the trenches and the shallows around the artifacts. Once I had the five trenches, I made the ground and box by cutting and gluing shoe boxes, the amount of hot glue that I used for this project was nuts! I then stuffed the box with crumpled paper so that it would be sturdier, glued the ground (with the trenches attached) to it and painted it to be more aesthetically pleasing. I covered the ground with white glue and poured sand over it to give it a nice texture (although I got so much sand on the floor I was sent outside by an irate mother to finish my task!). The tools, trowels, brushes and pick axes, all started out as toothpicks, tinfoil, wooden skewers and bristles from a toothbrush. I made the tables and tents next, as well as a sifting tray and jewelry for one of the tables. When I had finished it seemed like something was missing, so I added small pegs and string around each trench to mark them off. When I had finally completed this part of the project, it seemed like it had taken forever! In reality it took me about a week to make, I have to admit that I largely ignored my other schoolwork and stayed up way too late every night! It was worth it! I then made the artifacts, a ring, a bracelet, a die, a clay doll, a dagger and a couple bones, and a display case to put them it. Some of the ‘artifacts’ I made from scratch inspired by my studies in ancient civilizations. I “got my project out to the world” by putting it on display in my school’s library and the libraries of the school where my mom teaches and my elementary school. I should also add that anyone visiting the MOA should keep an eye out for the diorama! By the time that I had completed the project, most people in my class hadn’t decided what they were going to do for their projects yet; I guess I had gotten a bit inspired! 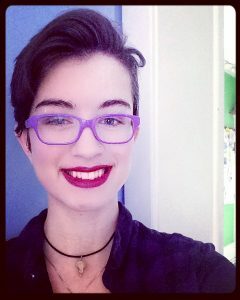 I’m thrilled that my history teacher gave me the opportunity to do this project and many more as the class went on, she’s a great person with unique assignments that make her classes so much more fun! I loved making this project so much, it gave me the opportunity to learn more about archaeology, which I find fascinating, and make something that I am very proud of. Wow! Awesome job! Looks so detailed and real. Thank you for sharing your passion project – process and product – with a greater audience through this article. Your teacher clearly understands the value of offering an opportunity for students to choose a topic, inquire about it, create something from it, and present it to an audience. These are all important elements of innovation. You seized the opportunity to explore, and “dig deep” (pun intended) into the culture of ancient civilizations. I look forward to seeing your project in person.